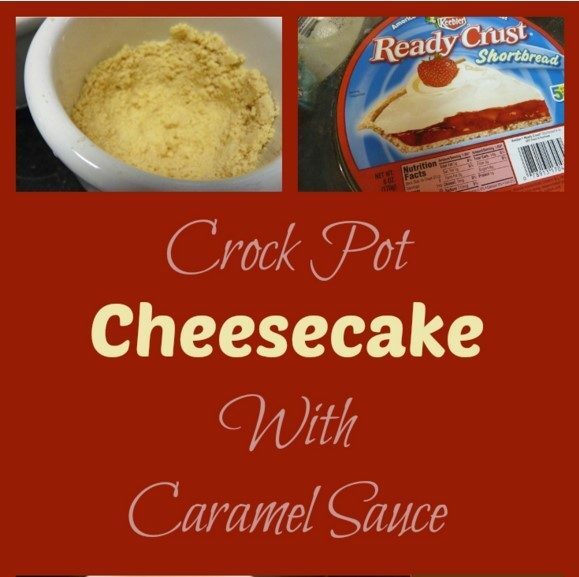 Crock-Pot Cheesecake With Caramel Sauce! 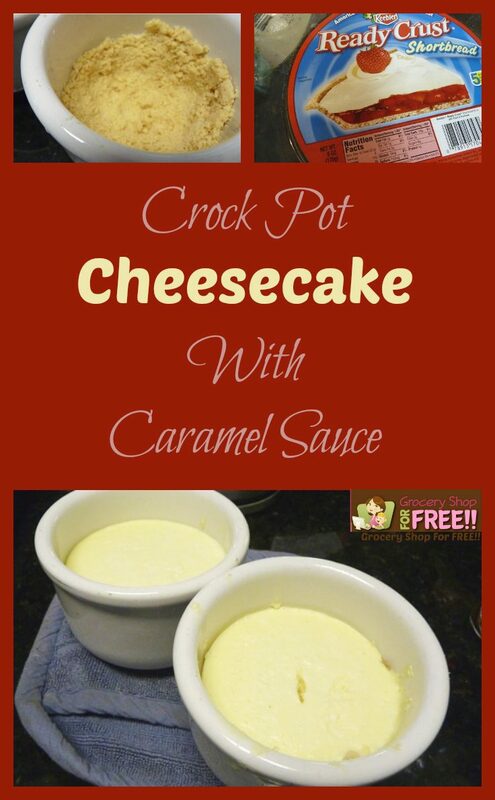 You are here: Home / Recipes / Cake Recipes / Crock-Pot Cheesecake With Caramel Sauce! 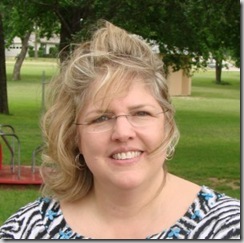 I read a blog post this week by Kristin at Kristin’s kNook about Crock Pot Cheesecake. I have never heard of such a thang! My son and wife, Ranger Joe and Army Wife, are here visiting before heading for Italy to join the 173rd Airborne. (Wah!) I needed a dessert but didn’t have any time to make one and remembered this cheesecake. I have to say that it was the fastest preparation of anything I have ever made…..at least prior to putting in the Crock-Pot. I changed it up a bit and here is what I came up with….enough for 4 people. I used 2 oversized ramekins. They each hold about 12 oz. But 4 small ramekins would work too. I only have 3 left (breakage over time). I used about 2/3 of the bought crust and just sort of took it out of the pan and pressed it into the bottom of the bowls and up the sides a little. It crumbled and didn’t stick well but it didn’t matter. My husband hates graham cracker crusts but if you like them, you could go with that. Then I heated the cream cheese for about 10 seconds in the microwave. Of course, if I had some time, I would have just set it out and let it soften. Then I added the rest of the filling ingredients and stirred it with a spoon until it was creamy. There were a few lumps but I didn’t have time to get out the mixer and these don’t matter. Pour the filling over the bowls. Put water in the Crockpot…..up about 1/3 of the sides of the bowls. Place the bowls in the water bath and turn the Crockpot on high. Cook for 2 hours. That’s it! Done! I cut them in half and made four servings and spooned store bought caramel sauce on top of each. YUMMY! It would have been good with fruit sauce or chocolate. Also, the original recipe had 1 egg (I put 2) and 1/4 cup peanut butter instead of sour cream. That sounds good but Army Wife isn’t crazy about peanut butter. I forgot to take a photo after I put it on the plate with Caramel Sauce. Hi, my name is Susan and I am a mother of four and a grandmother to 5 that, along with my husband and 2 dogs, take up my most of my time. I am a side-tracked Home Executive and I had the privilege of being a stay –at-home mom so, you might say that my passion is the home and making a haven for those I love.